Rasmalai is a Bengali dessert consisting of soft paneer balls immersed in chilled creamy milk flavored with cardamom powder. 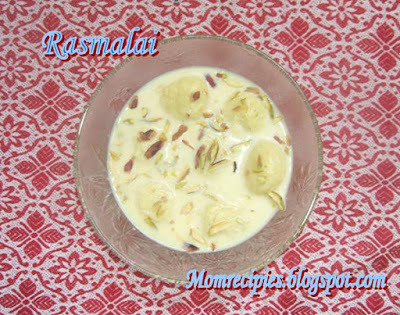 Like Rasgullas, Rasmalai is also made with homemade cheese known as “paneer” or “chana”. This is very delicious and easy dessert.It tastes best after refrigerating and serve chilled. 1. Heat milk in a pan and bring it to boil for about 8-10 minutes. 2. When it starts boiling, add lemon juice and wait for the milk to curdle completely. 3. Remove from the heat and let it cool for about 3-5 minutes. 4. Pour over a thin muslin/cotton cloth and tie it with a tight knot. On straining this milk, the curd is obtained is called "paneer". Wash paneer well using muslin cloth under cold running water to remove lemon juice flavor. 5. Knead paneer for about 5-7 minutes to make a smooth dough. 6. Make round shape flat balls (disc) of about 1 inch in size (8-10) of the dough and keep aside. 7. Next make sugar syrup. Mix sugar, water and cardamom powder in a saucepan and bring it to boil. 8. Add paneer disc to the hot syrup on a medium heat and cook for about 15-20 minutes with lid partially covered. 9. Make sure the pan is large enough to accommodate the finished malais, as they will expand to about double in the volume while cooking in the syrup. 10. Remove the paneer disc from the sugar syrup carefully and let it cool. 1. Add milk in a saucepan and bring it to boil. Boil this on over low flame for about 10-12 minutes. 2. Now add sugar, cardamom powder , saffron and bring it to boil for about 3-5 minutes. 3. Keep on stirring continuously, until it is reduced to thick consistency. (It should be reduced to 2 cups of milk). 4. Let the milk cool down for about 3 minutes. Then add malais one by one to the milk mixture and garnish with almonds and pistachios. 5. Refrigerate for about 6-8 hours. MANGO RASMALAI : In the above recipe, add ¼ cup mango purée to the saffron flavored milk. Garnish with fresh mango slices. Rasmalai looks perfect! Now making me crave for it! This is my hhubbs favourite indian sweet, just that i have neve rmade for him. Thats lovely dessert sireesha. U made it easy. Awesome. rasmalai!! !i love them..how are you. Where are you..yummy yummy dishes,aunty must be feeding you!! I am hude fan of rasmalai but never attempt from scratch! Perfect! Delicious dessert Sireesha...u made it so easily...lovely! Rasmalai looks perfect & Yummy.. NIce click..
First time here :) I landed here only to be welcomed by this wonderful sweet which is one of my fav. Thanks for the variation of this one, will try the mango rasmalaai sometime, nice snaps. Rasmalais are looking very yummy, I made them for my guests last month... After seeing your I feel like having some!!! Great that u made it from scratch! Yummy! 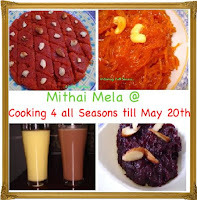 You could send this to Srivalli's Mitahi Mela..
Lovely Rasmalai,perfect time to try Mango dishes. Rasmalai looks rich and perfect.....I am drooling over it.. It is nice to see you come back again! 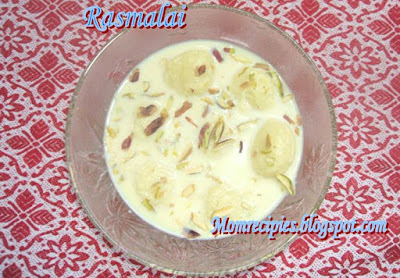 Trust you are doing good :) Rasmalai looks tempting ..
Wow, I love rasmalai.. looks yumm. hi sireesha, found your blog through valli's and was very tempted to try the ras malai recipe. i made it today and while it came out alright, the pieces were not as soft as they should be.. i'm wondering what could have gone wrong - could the dough not have been kneaded enough? did i boil it too long in sugar syrup? did i make the discs too small? could you point out what are the possibilities for it being dense please? i really want to get this right..